I am pretty sure that almost everyone who has been diagnosed with a digestive disorder did not have it done quickly or easily. Typically, it takes years with a lot of trial and error to be diagnosed properly. For me, it was years of doctors telling me to keep an eye on it and check back next year, thinking it was due to stress, lactose intolerance, thinking it was due to stress again, me not taking probiotics, maybe stress, irritable bowel syndrome, small intestinal bacterial overgrowth, and eventually getting the diagnosis of fructose malabsorption. It was a long and frustrating road of feeling sick, not knowing why, and dealing with fatigue, joint pain, brain fog, and other side effects in addition to the obvious stomach issues. I partly felt like a lab rat with doctors testing their different theories as they asked if I was in therapy, recommended I meditate and/or do yoga, switch to lactose free milk, reduce my fiber, take probiotics, etc. It was not until the pain escalated to the point where I needed to go to the emergency room for the first time in my life, that it was taken seriously and they started running diagnostic tests to see what was wrong. These took almost a year and then it was years of visits to my nutritionist and experimenting with different foods. A process I am still fine-tuning and probably will always need to do. I am not complaining because I know I am lucky. I met a woman during one of my breath tests who after ten years of suffering still did not know what was wrong with her and lived on a diet of chicken, potatoes, and rice. I have read blogs and have been amazed by the stories of other sufferers of digestive disorders. Also, I have a manageable digestive disorder, which although can be difficult, is not damaging my small intestine. But it has been a process, and one that in many ways I shared alone because I did not know of others in my life going through what I was going through. And honestly, how do you begin a conversation with “So, have you also been feeling constipated, bloated, exhausted, and experiencing joint pains?” Not the best conversation starter. 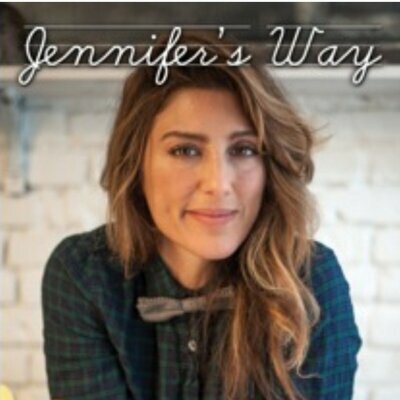 Jennifer’s Way, a book by the actress, business owner, baker, author, and celiac disease advocate, Jennifer Esposito, was my support group and an incredible help for me as I was going through this process. Jennifer’s Way offers an open, honest, interesting, and thoughtful perspective of Jennifer’s experience starting as a young girl to when she was finally diagnosed with celiac disease as an adult. Jennifer struggled for many years with being very sick and being told by doctors that it was all in her head. Even though I have fructose malabsorption, I was able to relate to Jennifer’s story in terms of how many years she struggled with symptoms and was not diagnosed. Additionally, I connected with her process of figuring out what she could eat once it was determined that she had celiac disease, the sadness over the foods she could not eat anymore, and the perseverance to make it work. Knowing that I was not alone and hearing someone else’s story made me feel seen and validated in a way that I had not felt before. Jennifer’s book is an easy read and one I recommend for anyone with a digestive disorder. You can learn more about Jennifer’s book, bakery, and read her blog at http://jennifersway.org/. Do you have other books that you can recommend?